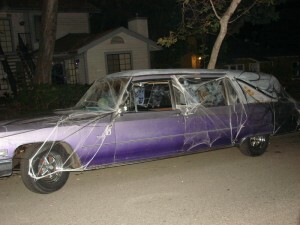 TC's vehicle was well re"hearsed" for its role in the festivities. Posted 11/2/11 – Halloween in Sierra Madre has come and gone, but as always, it was quite the event. This town sure knows how to do Halloween! Click on the links below to see photos and video from the event! Enjoy. Please note that all photos and video are Copyrighted material. You are welcome to use them for personal use, but if you are going to post them on the internet (say, on your Facebook page), please put the words “Copyright 2011, Bill Coburn” in the caption. Halloween Preview of Alegria Ave.